A map I currently work on. 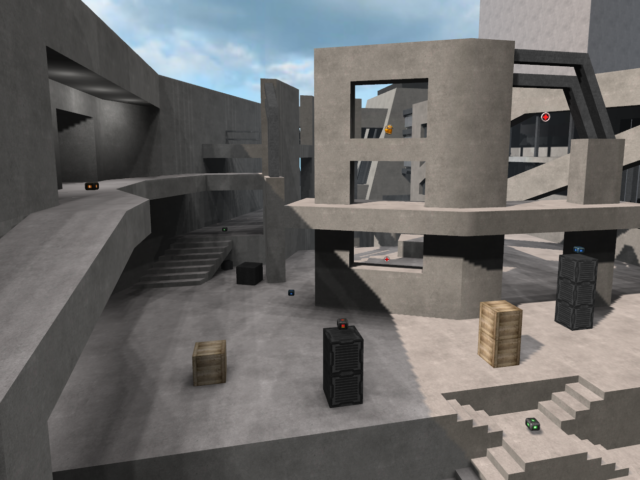 My goal is to make a map that pro players like to play (hence some advanced jump options), and that does not distract from the gameplay too much. BTW, if you have good ideas for a name, let me hear! The current one is just out of need of a title to put it here on quadropolis. I really think it needs a second floor, like I said before. I think you could run a bridge from the top teledest with the two healths to the slanted structure next to it, and then run a ramp from the stairs below up to that bridge. That would get you started, but you should find a way to extend that idea to the rest of the map; i don't think its impossible. Another possible jumping off point would be near the quad over the green armor by the glass, that could easily become an overhanging area, and you could shrink the pointless tower down to a large block and connect it with a ramp, making it possible to jump from one top part to the other across the map (using the diagonal ramp you already have between the tower and the teledest). Put spawns and armor up there, rockets, maybe make the floor thin enough that the players below can rocket you off.... Then we're starting to have a map, rather than a flat slab with weapon jumps and boring fights/rifle lameness. I like where you're going, but the layout still needs work before you start into the pretty stuff that I have absolutely no idea about. PS: While I was writing this comment I went ahead and used my kindergarten or below level mapping skills to do up some of the ideas I said above. I'll show it to you when you're back on irc. that's a first try at extending the map vertically, and I think it incorporates a couple things you mentioned. I told you ingame! :) Interesting to see, other people also vote for vertical extension. Ever taken a look at warsows wdm1 (and wdm6)? There are some nice "second floors" (and connections). Other than that: good job, keep it up. so the map looks full of walls and buildings that dont correspond to each other. Good luck trying to convert the whole thing without smashing everything into oblivion.